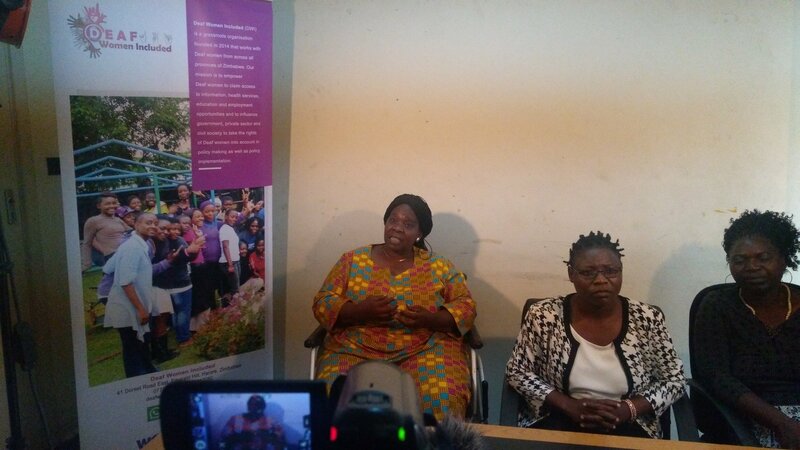 Deaf Women Included(DWI) has cried foul over the discrimination that is still prevalent in Zimbabwe on people living with disability that has left them without access to opportunities that are being enjoyed by the able bodied persons. Founder of DWI Agnes Chindimba said, “there is double discrimination on women first because of their disability then because of their gender. How are they going to fit in society? When people see me usually they do not see me as human they see me as Agnes the deaf, disability should not define me, by seeing my ability first you are limiting me”. Chindimba said discrimination has reached even to the health services whereas that is where the disabled people should be well taken care of. “In antennal care, when you are disabled you cannot give birth to a child they think you are disabled the whole body. You hear nurses saying you are blind but you keep on giving birth giving us unnecessary work. If I go to the blood transfusion today, they will tell me that because am disabled I can’t give my blood. It doesn’t mean that if I’m disabled my blood is also disabled. Sometimes I just want to be part of the society and contribute to its development. Chindimba added that the disabled people are competing with the able people when it comes to education even there have a degree the able persons are given first preference when a company is employing workers. She further said disabled people need to be empowered and take rightful places in the society so as to develop their communities. “Disabled people should be given places to sell their things and they will keep those places clean. We are not asking for charity. I wouldn’t want someone to say Agnes here is $10 because I’m deaf. I want to be empowered so that I will be able to take care of myself because giving me charity is not empowering. If you give me that $10 tomorrow, I will come back.” she added. Senator Rejoice Timire said the government should look into issues to do with human rights so that people should look at disabled people as humans. “We have an Act 92 Disability Act, that Act it has got its own gaps. We are looking forward the Act, the policy that we are looking forward to have and the Constitution all these things to be in harmony with the Convention on the rights of people with disability. This will give us our rights as people with disability in Zimbabwe and we can also stand that we now have documents which really shows that we are humans in Zimbabwe. Human rights are disability rights; disability rights are human rights. DWI is a grassroots organisation founded in 2014 that works with Deaf women from across all provinces of Zimabwe to empower deaf women to claim access to information, health services, education and employment opportunities and to influence government, private sector and civil society to take the rights of Deaf women into account in policy making as well as policy implementation.